Historic Northampton 46 Bridge Street, Northampton, MA. The sprawling brick complex in Northampton, Massachusetts called “Brushworks Arts and Industry” hosts the studios of a hundred artists and craftspeople. But the brush in “Brushworks” isn't a paintbrush, it's a toothbrush. The building had been the home of the Pro Corporation, a late incarnation of the first mass-market producer of toothbrushes in America. Under different names and ownerships, the company spanned the manufacturing life of this lively city on the Connecticut River, beginning in 1854 as the A. P. Critchlow & Company (soon the Florence Manufacturing Company) making buttons, daguerreotype cases, and hairbrushes. As the Pro-phy-lac-tic Brush Company, it became the world's largest producer of toothbrushes and then plastic cases for radios, telephones, television sets, and, by the 1980s, computers. The Pro Corporation closed in 2007. 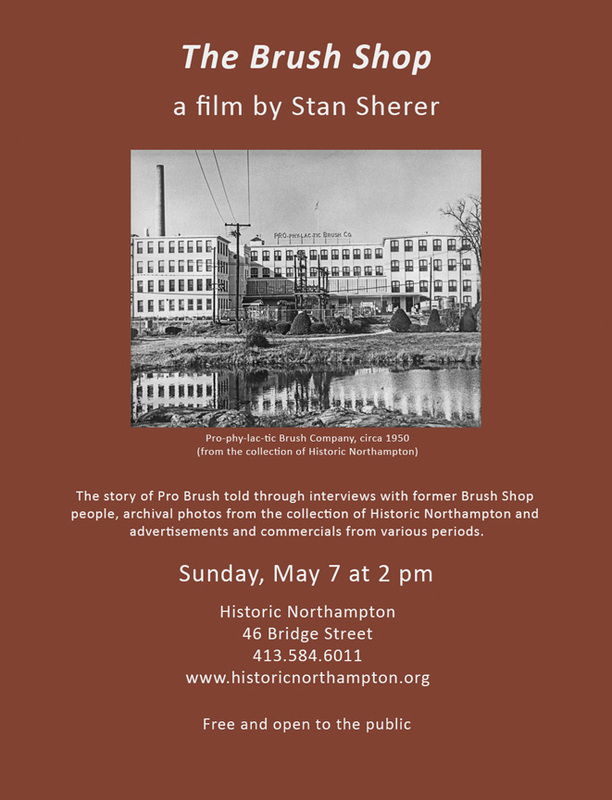 In its heyday, “The Brush Shop,” as locals called it, grew in tandem with growing national concern for oral hygiene to become one of the city's largest employers. Many families had several members working there, and often more than one generation. Through interviews with former Pro Brush people, archival photographs from the collection of Historic Northampton, and commercials and advertisements from different periods, this film tells the story of a vital Northampton industrial history.